One of a half-dozen drones which have been confiscated for being flown in the no-fly zone over Mercedes-Benz Stadium is displayed Friday, Feb. 1, 2019, in Atlanta. 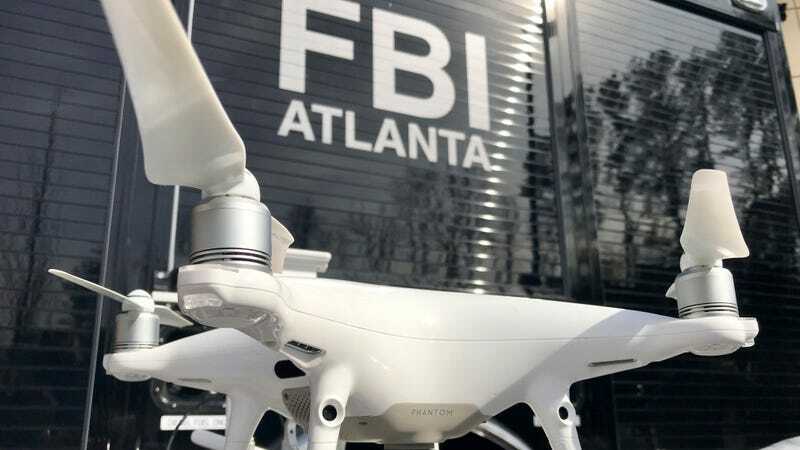 The FBI is cautioning drone pilots against flying them anywhere near the site of the Super Bowl in Atlanta—not only on game day but leading up to it as well. As the Associated Press noted, for a good example of how seriously officials take this kind of activity, look no further than the London’s Gatwick Airport. In December, multiple drone sightings resulted in the disruption of more than 1,000 flights over the course of three days as investigators struggled to determine the motivations behind the incident. Such a stunt at an airport in the U.K. could carry a sentence of five years in prison and an unlimited fine. As for the Super Bowl? Aside from possible jail time, Politico reported that drone ban offenders could be looking at up to $20,000 in fines. The FAA said it’s currently restricting drones within one nautical mile of the stadium, but that the flight ban will stretch to 30 nautical miles beginning at 5:30 p.m. and ending around midnight on Sunday. So, you know, it’s probably best to just avoid flying a drone in Atlanta for the remainder of the weekend.